Cook and drain orzo as directed on package. Meanwhile, in 12-inch nonstick skillet, heat oil over medium-high heat. Cook carrots and bell pepper in oil 7 to 9 minutes, stirring occasionally, until tender. Add garlic; cook and stir 1 minute. Stir in peas. Remove from skillet to bowl. In same skillet, heat 1 tablespoon of the butter over medium heat. Cook shrimp, salt and pepper in butter 1 to 2 minutes, turning once, just until shrimp start to turn pink. Stir in broth and 1 tablespoon of the butter. Stir in vegetable mixture. Spoon cooked orzo into baking dish. 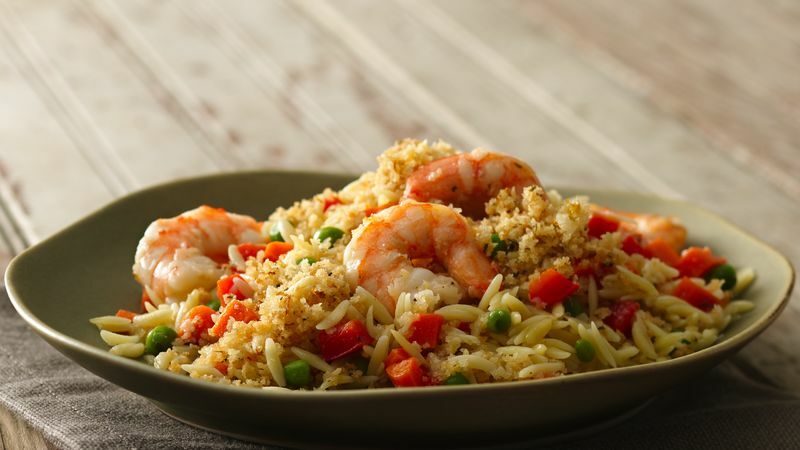 Spoon shrimp mixture over orzo. In small microwavable bowl, microwave remaining 2 tablespoons butter uncovered on High 1 minute or until melted. Stir in bread crumbs, lemon peel and oregano. Sprinkle over shrimp. Bake uncovered 15 minutes or until thoroughly heated and crumb topping is golden. Buy shrimp already peeled and deveined to save time on preparation. Panko bread crumbs are Japanese-style bread crumbs with a larger, coarser and crunchier texture.